Councilman Kwame Kenyatta calls for public to weigh in at committee meeting Thurs. 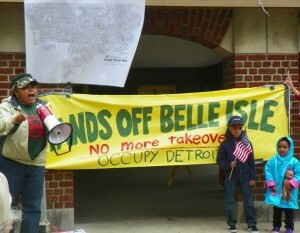 Oct. 4, 1 p.m.
DETROIT – Grass roots Detroiters, many from community groups, turned out Sept. 21 to save their beloved Belle Isle from a state takeover Sept. 21, rallying in front of a bright yellow banner declaring “Hands Off Belle, No More Takeovers, Occupy Detroit,” affixed to Picnic Shelter #2. They were also mobilizing to defeat Public Act 4, popularly known as “The Dictator Act” in the coming November elections, vowing to go door-to-door in the community to educate people about the dangers of PA 4. It led to the April 4 “Fiscal Stability [consent] Agreement” which has stripped Detroit’s elected officials of most of their final powers. 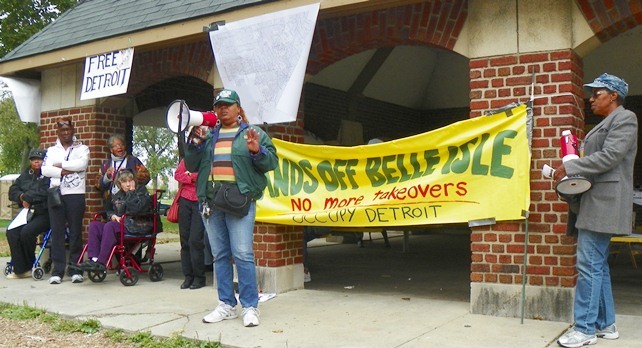 Even if Detroit’s City Council votes down a proposed state lease of Belle Isle, their decision can be overridden under that agreement, contrary to City Charter provisions. 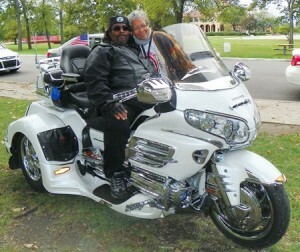 Punco of the Black Motorcycle Riders Club pull up to rally, is greeted by Valerie Glenn of Free Detroit-No Consent. They swelled the ranks to at least 100 on a rainy day. Among them was “Puncho,” who roared in on his brilliant white and chrome bike, representing the Black Motorcycle Riders Association. Although state proposals for an annual Belle Isle entry fee say that pedestrians, bicyclists and boaters can enter the island free, all vehicles including motorcycles would have to have a $10 annual state “Recreation Pass” to get on the island. Classic Chevy Caprice on island. 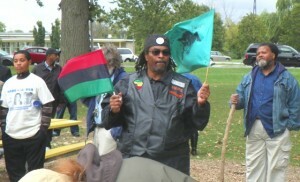 There are further fears that a proposed “public safety” force on the island, comprised primarily of state troopers including park rangers and conservation officers not familiar with Detroit, may hinder residents like Puncho and young Detroiters with their skillfully renovated classic cars from the 1960’s, 70’s, and 80’s, from enjoying the publicly-owned mecca on balmy summer week-ends. 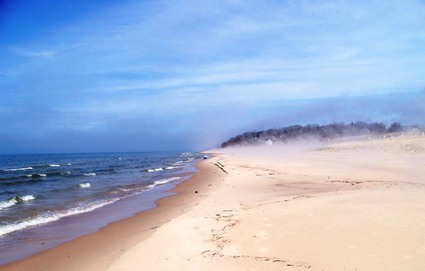 Beach on Lake Michigan at Jean Klock Park in Benton Harbor. Cecily McClellan of Free Detroit No Consent compared the Belle Isle proposal to what has happened in Benton Harbor, where corporations including Whirlpool took over land adjacent to the publicly-owned Jean Klock Park, which has a gorgeous beach with a spectacular view of Lake Michigan. “Benton Harbor residents have been impoverished, unemployed, and foreclosed on since the takeovers there,” McClellan, who has spoken at rallies in the small majority-Black city on Michigan’s west coast, said. Some of Belle Isle ralliers, including Puncho, who denounced Mayor Dave Bing. 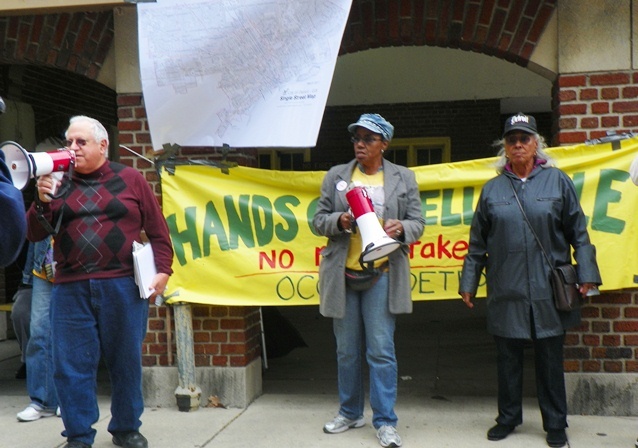 Phyllis McMillan, president of Recreation Department Local 542 of the American Federation of State, County and Municipal Employees , gave an eye-opening report on the reality of what has been happening to the island. Grass roots crowd listens to speakers at Belle isle rally 9 22 12. She said Detroit City Councilman Andre Spivey was on the island earlier in the week to take a tour before dealing with the state proposal. 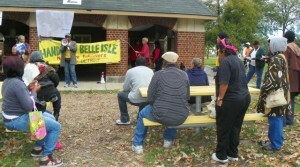 Monica Patrick speaks: Belle Isle for our children! McMillan said Ingham County Circuit Court Judge Paula Manderfield invalidated two sections of the Detroit consent agreement in her ruling on a lawsuit by AFSCME Sept. 12, Sections 4.1 and 4.3, restoring collective bargaining rights that would force the city to negotiate terms of any changes to the Belle Isle workforce. Although she said she would issue a written stay of her order while the City appealed, according to state records, she has not done so yet. But Mayor Dave Bing and Michigan Governor Snyder are proceeding as if she never ruled. As wind gusts and rain brought an end to the rally Attorney Jerry Goldberg of the Moratorium NOW! Coalition wrapped up it, pinpointing the devil behind the scenes. 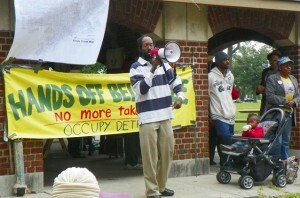 The rally was sponsored by Free Detroit-No Consent, Hood Research, and We the People of Detroit. I get a bit tired of reading of the grants that are doled out to wealthy Ann Arbor and to hugely rich UM with no questions asked. But when Detroit taxpaying citizens need financial help, it is only offered if the state can control them.